With the reach of U.S. surveillance now global and with the U.S. military deployed all over the world anger at President Obama’s unprecedented crackdown on whistleblowers who disclose the U.S. government’s abuses and crimes has gone international, as this Norwegian opinion piece by Victor Wallis shows. The more extreme the crimes of state, the more the state seeks to shroud them in secrecy. The greater the secrecy and the accompanying lies, the more vital becomes the role of whistleblowers and the more vindictive becomes the state in its pursuit of them. Whistleblowers are people who start out as loyal servants of the state. Their illusions about the state’s supposed moral agenda and the wholeheartedness of their own patriotic commitment make them all the more shocked when they discover evidence of the state’s wrongdoing. Poster in support of Pvt. 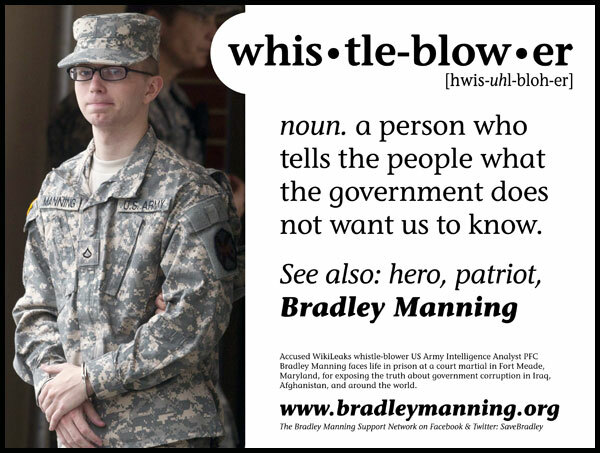 Bradley Manning, posted in Washington D.C.’s Metro system. Given the extreme concentration of weaponry (as well as surveillance capabilities) in the hands of the state, and given the disposition of the state to apply such resources even against nonviolent mass movements, the type of defection practiced by whistleblowers an option available to military and intelligence operatives at all levels is crucial to any eventual triumph of popular forces over the ruling class. Whistleblowers thus not only embarrass the government, disrupt its policies, and (assuming adequate diffusion) educate the citizenry; they also are harbingers of a broader crumbling of the capitalist state and the order it defends. Acting largely in isolation and at great risk to themselves, they embody the conviction or at least the hope that basic decency has a more universal grounding than does any possible scheme of oppression. Whistleblowing’s principal near-term function is educational. It demonstrates the undemocratic character of the regime whose secrets it lets out; it is thus an essential ingredient of investigative journalism. The documents it brings to light reach the public through those who practice such journalism, whom the government then threatens with prosecution unless they disclose their sources. The novelty of Wikileaks is that it provided a new form of protection for the anonymity of sources. This, together with the facility of electronic transmission, has made the potential for disclosure greater than ever before. It accounts for the extraordinary fact that the U.S. government has been pursuing draconian charges against someone who not merely is only the recipient rather than the “leaker” of sensitive information, but someone who is not even a citizen or resident of the United States Julian Assange. Disclosure is particularly embarrassing when it documents the fact that government officials have lied. The Director of Central Intelligence lied under oath to the U.S. Congress a felony for which he was never prosecuted when he denied that the National Security Agency monitors the communications of the entire U.S. population. This lie was the culminating event in Edward Snowden’s decision to blow the whistle. As we all know, of course, it is Snowden who was then criminalized by the government. This parallels the experience of John Kiriakou, who publicly confirmed, on the basis of his first-hand knowledge, that the CIA practiced torture by waterboarding. Kiriakou then became the only government official to be prosecuted and imprisoned in connection with CIA and military practices of torture. The debate over whistleblowers reached tens of millions of viewers when the presidential candidates of the Democratic Party were asked (on Oct. 13) their views about Snowden. Hillary Clinton falsely asserted that he could have used established channels to transmit his disclosures of excessive surveillance, presumably at no risk to himself. What Sterling had done was report to the U.S. Senate Select Committee on Intelligence about a counterproductive CIA attempt (in 2000) to feed misleading technological data to Iranian scientists. What he was prosecuted for was his subsequent conversations with New York Times journalist James Risen, although no evidence was available as to the content of those conversations, since Risen refused to testify. Sterling’s story is recounted in a letter from his wife, seeking presidential clemency from Obama. Sterling had been fired from the CIA in 2002 after filing a complaint against the agency for racial discrimination (an episode on which Risen wrote a news story). After Risen’s book State of War (2006) came out, the FBI raided Sterling’s home, but it was not until more than four years later under President Obama that he was arrested (2011). The latest whistleblower, who documents the “normalization of assassination” via drone warfare, is wisely seeking to remain anonymous. The U.S. government will surely take all possible steps to track him down. The work of whistleblowers, as well as their personal safety, is obviously an issue that cuts across national borders. Support for U.S. whistleblowers will need to be as global as the reach of the policies and the weapons that they expose.